This is the second instalment of a “Scaling Agile” blog series. The first instalment was “Scaling Agile: A Law And Two Paradoxes”. Before proceeding further, please, read it, as it sets the context for what follows. Q1: How many people and teams can be added to the project to deliver more features in less time? Being able to answer Q1 is important as “deliver more faster” seems to be the main reason for scaling up in most large software projects. As it happens, some time ago, I was hired as a consultant in a very large scale agile project precisely to answer that question. The very first thing I did was to survey the literature to find if anybody had already answered Q1. In the process, I discovered that the scaled agile literature has quite a bit of information about the pros and cons of component vs feature teams, but—despite this being a very obvious and important issue in the context of scaling—I couldn’t find much information that would help in answering it. There are three important things to notice. The first is that the cost per deliverable will increase (or, equivalently, productivity will decrease) more than linearly with the number of people involved, and it may become unacceptable well before scaling to k teams. 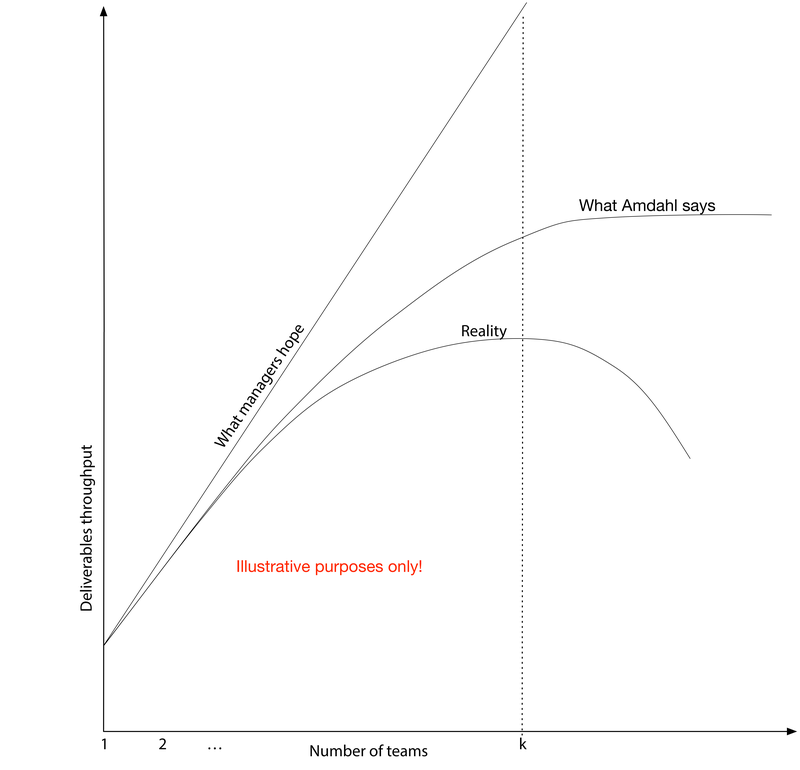 The second is that the shape of the “Reality” curve above is independent on the type of teams—component or feature, or any mix of the two—and it will always below Amdahl’s curve. The third is that, independently of any methodology or process used (agile or otherwise), the curves for the throughput will always resemble the ones above. In other terms, those relationships are more fundamental than the methodologies used and cannot be eliminated or avoided. The team is given all the necessary resources to perform their job—e.g., software, hardware, office space, etc. As you can see, adding people might, in some circumstances, make the project faster, but there are some hard limits to the number of people and teams that can be added, and the costs will increase more (usually much more) than linearly with the number of people—even in an almost ideal situation. As my friend Allan Kelly says: “Software has diseconomies of scale – not economies of scale”. If you, despite all the dangers, decide to scale up your project, and try to do so applying the recommendations above, I would love to hear your feedback about how it worked out. The next instalment of this series will be about component teams vs feature teams.